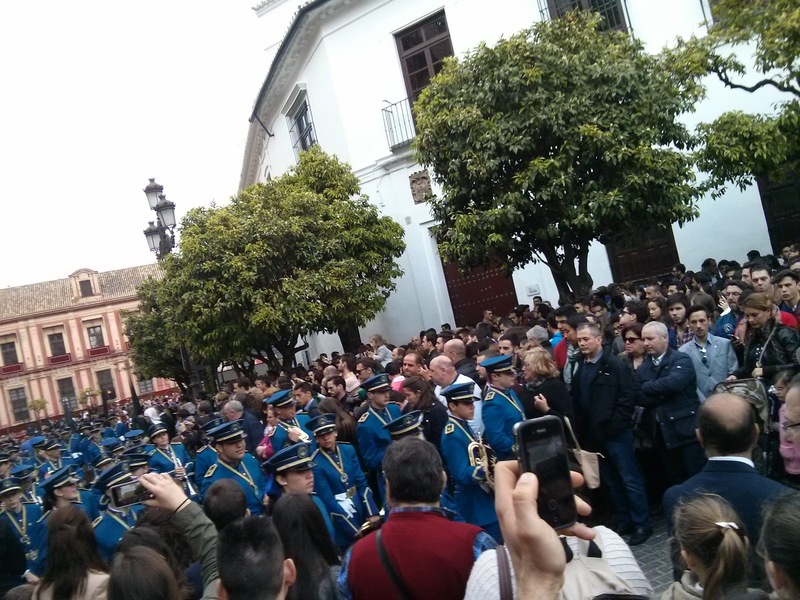 If you are in Seville during the Semana Santa week, its almost impossible to miss the sheer excitement in the city. Its almost like the whole city comes to the halt for the evening procession. So what is “Semana Santa”? “Semana Santa” means “Holy Week”. Starting with Palm Sunday, the last week of Lent leading up to Easter Sunday is a pretty big deal in Spain, but especially in Seville. Even if you aren’t religious, it is impossible to miss the incredible celebrations. What’s the celebration about? So the churches have hermandades (“brotherhoods”), which are like religious organizations/clubs that people can join. In Seville, the 55 or so brotherhoods take part in the processions carrying over 105 pasos (floats) that carry imageries of Jesus, the Virgin Mary, the Saints, etc. The icons are cared for all year long and then during Semana Santa they’re carried through the streets in grand parades/processions. The processions are managed by the city, which sets very specific schedules and provides other kinds of preparation and assistance, including police officers, barricades, blocking off streets and public transportation, etc. How to view it? First thing to do is choose a procession to try and see, and then try to get there early so you can get a good spot. In some areas, we saw stadium-style seats which I am told are booked in advance and are pretty expensive. Husband and I were pretty tired due to the 300 am start and we didn’t intend to see the full procession. So we found a spot near the cathedral but it was a free spot – meaning people could just stand on the road and view the procession pass. It important to go a bit in advance of the schedule because by the time of the procession, it was pretty packed. The Marching Order – We noticed that in the procession, the first thing was the Cruz de Guía (the guiding cross) and then followed the ‘nazarenos’. These are people that march in front of the pasos, and are members of the brotherhood who have volunteered to do this. Some carry small crosses or rosaries, candles, and some even hand out candy to kids that are in the crowds watching them pass by. 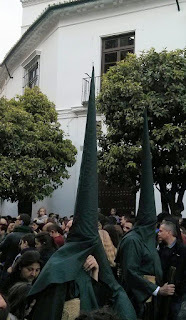 The nazarenos wear long robes and capirotes: pointed caps, along with hoods that cover their faces, except where there are slits for their eyes. The colour can vary with the brotherhood but we mostly saw either black or white. It can invoke an image of the Ku Klux Klan however let me reassure that there is no connection whatsoever. The people who wear the capirotes are respected for their religious devotion and commitment. Then comes the “paso” – am image or a set of images set up on a movable wooden float. The structure is richly carved, ornately decorated, colorful, covered with flowers and magnificent to the viewer. Most hermandades have a paso with Jesus, and one with Mary, but some have an additional paso depicting a scene from the Bible. Many of these pasos are kept on display inside their churches so they can be enjoyed throughout the year. The pasos were moving and stopping at intervals and that is when we realized that they weren’t actually moving on wheels. They were actually carried by members of the hermandades! I later found out that the pasos usually weigh around 4,000 pounds and between 25 and 50 people, called costaleros, carry the pasos on their back and shoulders. People volunteer to do this job! The team of men called the costaleros (literally "sack men", for their distinctive - and functional - headdress), supporting the beams upon their shoulders and necks, lift, move and lower the paso. As they are all inside the structure and hidden from the external view by a curtain, the paso seems to move by itself. As each procession leaves its home church, (an event known as the salida), at its return (the entrada), and along the march route, improvised flamenco-style songs may be offered by individuals in the crowd or from a balcony. These songs are generically calledsaetas (arrows). The high point of the procession is when the float exits and enters the respective church. For the people of Seville, it was generally just a time to be social. Kids enjoy holding out their hands to try and get candy from the nazarenos. The entire scene is alive with colour and sound, thanks to the polychromatic variety of tunics, hoods, ensigns and banners, in short, its one of a kind of experience.